The chemical transformation and removal of atmospheric trace gases by heterogeneous processes involving water droplets in clouds and fog, sulphuric acid and particulates is of great importance for atmospheric chemistry, since it is known that these processes can lead, for example, to major shifts in gasphase photochemistry. For the removal of atmospheric nitrogen compounds, heterogeneous reactions leading to the final end-product nitric acid (HNO3) are of special interest. However, these reactions may also lead, at least in part, to the formation of other nitrogen species such as nitrous acid (HONO) and nitrous oxide. In a study in the mid-1990s, Wiesen et al (1995) studied the heterogeneous conversion of NO2 on different surfaces in both an 11-litre Pyrex glass reactor (surface to volume (s:v) ratio ~22m~1) under simulated atmospheric conditions and in a 64-litre quartz glass reactor (s:v ratio -21m-1). The quartz glass reactor was equipped with a White mirror system (base length 2.0m), and operated at reduced pressure, which allowed in situ concentration measurements of the different species by long-path tunable-diode laser absorption spectroscopy (TD-LAS). In a first set of experiments the authors studied the heterogeneous conversion of NO2 in the quartz glass reactor (White cell) in the dark. Concentration-time profiles of NO2, HONO and N2O were determined for initial NO2 concentrations, which were varied from 1.5 to 26ppm in dry synthetic air. Figure 9.5 shows a typical concentration-time profile for NO2, HONO and N2O. Since it proved to be very difficult to control the surface activity of the different reactors the experimental set-up was modified. 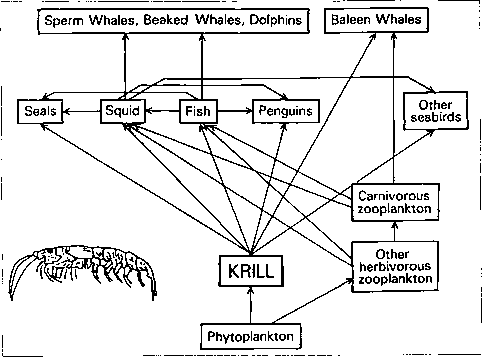 Instead of the White cell, a long-path absorption Herriott cell was used for monitoring the different species. In addition, the gas mixtures in the 11-litre Pyrex glass reactor were pumped continuously through a bubbler containing different solutions, using well-defined parameters such as concentration, temperature, volume, flow velocity and bubble diameter. It was observed that N2O formation took place in acid solutions such as H2SO4, HCl, HClO4 and H3PO4, whereas for water or different salt solutions no N2O formation was observed (Figure 9.6). In a first step, Reaction 9.5, NO2 is converted on the surface into HONO and HNO3. In the reaction system the NO2 decay constant was found to be independent of the NO2 concentration and the volume of the sulphuric acid solution but was found to be directly proportional to the surface area. Accordingly, the observed NO2 decay should mainly be caused by an uptake of NO2 in the sulphuric acid solution. In a second step, Reaction 9.6, dissolved HONO reacts with sulphuric acid to form NO+HSO4~. It is proposed that the nitrosyl cation (NO+), which is a strong oxidizer, oxidizes HONO to form HNO3, Reaction 9.7. Through this reaction NO+ is reduced to (HON)2, which can easily decompose into N2O and water, Reaction 9.8 (Greenwood and Earnshaw, 1984). For H2SO4 concentrations >55 wt per cent HONO is converted almost completely into NO+HSO4-. Accordingly, no HONO can be observed in the gas phase and Reaction 9.7 slows down because no HONO is available. As a consequence, less (HON)2 can be formed, resulting in less N2O formation. For low H2SO4 concentrations, the N2O yield is also small. This is probably caused by the low formation yields of NO+HSO4-, Reaction 9.6, since it is known that NO+HSO4- is not stable in an excess of water (Coleman et al, 1939). Based on the proposed mechanism, the observed maxima in the N2O formation rate must occur for H2SO4 and HClO4 concentrations for which NO+ and HONO concentrations are equal. 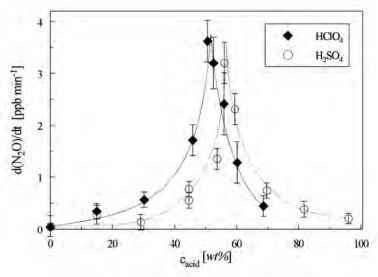 Previous studies in which the equilibrium between NO+ and HONO was investigated as a function of acid concentration reported equal amounts of NO+ and HONO for 56 wt per cent H2SO4 (Seel and Winkler, 1960; Bayliss et al, 1963; Becker et al, 1996) and 52 wt per cent HClO4 (Singer and Vamplew, 1956; Turney and Wright, 1958; Bayliss et al, 1963), which is in excellent agreement with the result from the present study. It should be pointed out that the proposed reaction mechanism can also explain the experimentally observed formation of N2O in the presence of other acid solutions such as HCl and H3PO4. In order to estimate the possible influence of the conversion process investigated on the global N2O budget, a simple estimation was performed for a s:v of the atmospheric aerosol of 3 X 10-4 cm2 cm-3, which is often observed in heavily polluted air masses. Furthermore, it was assumed that 5 per cent of the aerosol consists of 56 wt per cent H2SO4 with an uptake coefficient of 3 X 10-7 (Kleffmann et al, 1998a). A global source strength for NOx of 160Mt yr-1 (as NO2) was used (Lammel and GraEl, 1995) with an atmospheric NO2 conversion rate of 10 per cent hour-1 (Finlayson-Pitts and Pitts, 1986). Based on these assumptions a global N2O source strength from NO2 conversion of 100kt N2O/yr was calculated. If one takes into account that N2O formation occurs also on aerosols with cH2SO4 >56 wt per cent and that other sources, for example NO2 conversion processes on soils, contribute to atmospheric HONO formation, an upper limit for the global N2O source strength from NO2 conversion of 0.3Mt N2O yr-1 can be roughly estimated. This result can be compared with the deficit of ~3Mt N2O/yr in the global N2O budget. Accordingly, only 10 per cent of the deficit can be explained by heterogeneous NO2 conversion on acid surfaces. Another possible source of N2O formation in the atmosphere that has been discussed is the heterogeneous reaction of N2O5 with ammonia on wet aerosols, proposed by Behnke et al (1997). Yet another possible source was proposed by Zellner et al (1992), Maric et al (1992) and Kummer and Zellner (1997): the photochemical formation of N2O in the atmosphere through the gas-phase reaction of electronically excited NO2 and NO3 radicals by reactive collisional quenching with molecular nitrogen. 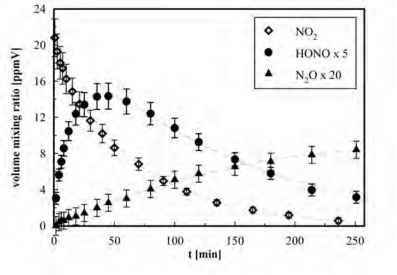 Adema et al (1990) suggested heterogeneous formation of N2O in air containing NO2, O3 and ammonia. The authors suggested a rather complex reaction mechanism; however, they did not provide an estimation of how much N2O may be formed in the atmosphere by the suggested mechanism.